First, let me say that I am talking about traditional electric element storage tank style water heaters. I’m not talking about instant-on water heaters, point of use water heaters, heat pump water heaters, or anything other than your basic 30-80 gallon tank sitting in the typical Southwest Florida garage, closet, or attic. Virtually all electric element water heaters in this area have a power guzzling 4,500 watt element that runs at full bore whenever water heating in the tank is required. Actually, there are usually two elements, but typically only one runs at a time. 4,500 watts will make the hamster in your electric meter spin right off the wheel. It is equivalent to about 50 cents of utility electricity per hour when heating water. FPL and LCEC make a lot of money from your hot showers! How do companies get away with advertising energy efficient water heaters? Well, the tank itself can be more efficient by adding insulation to reduce standby heat loss – heat lost through the tank into surrounding areas. That has nothing to do with how efficiently the tank heats the water. All tanks use basically the same element and you get the same amount of water heated using the same 4,500 watts. Most tanks produced in recent history have significant amounts of insulation, and standby loss is not a big factor in determining how much electricity you will consume. How much hot water you use has a much, much greater effect. If you left your hot water tap opened all day, your 4,500W element would run all day (the electric element can’t heat water as fast as it comes out of the tap). You would consume the same amount of energy (108 kilowatt-hours per day) no matter what model of water heater you own. Remember, there is no energy efficient electric element water heater! So how do we heat water efficiently and really save money without being duped into buying an energy efficient electric water heater? With the sun, of course! I’ll go into how solar water heating works another time, but the general concept is to run that electric element a whole lot less. Every hour of run time we eliminate, we save about 50 cents! Previous Post: Is It Better To Mount Solar Panels On East Or West Roofs? Next Post: Solar Water Heating Without Replacing Your Tank! More power to Jason and his team, or should we say…”less” power. He’s so right–there is NO energy efficient electric water heater. Heating water is the 2nd largest contributor to utility costs for the average family. It looks like Jason’s next post will show readers how the sun can be used to offset those utility costs for heating water. We’ll be reading with great interest! FAFCO, Inc. I have to be a bit careful with what I say here. Jeff is the VP of Sales & Marketing at FAFCO, Inc. They supply us with our solar pool heating and solar water heating products. He is a great help to us dealers, and a big proponent of solar water heating. 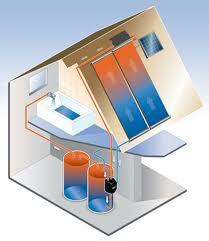 In Southwest Florida solar water heating is definitely a large part of any home’s electricity costs. Air Conditioning is just about always the top consumer of electricity. If you have a pool, usually pool pumping is next. If you heat your pool with a heat pump, that is usually second or third. So solar water heating can be the second, third, or fourth largest energy hog in your home around here. In any case, watch your electric meter spin after a long shower. It will spin your head!